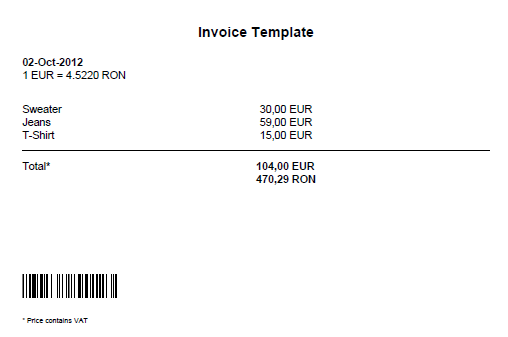 Because version 5.3 brought possibility to insert a report in another report, now you can generate even invoices with NextReports. For that a new bar code element was added. 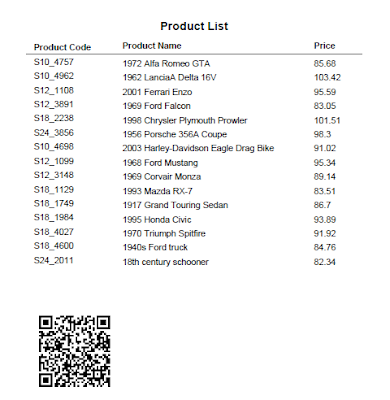 The following bar code types are supported: EAN.UCC-13, EAN.UCC-8, UCC-12, UPC-E, SUPP2, SUPP5, CODE128, CODE128-RAW, INTER25, CODE39, CODE39EXT, CODABAR, PDF417, DATAMATRIX, QRCODE.